The Great British Bake Off: Who Knew Bread Could Do That? Previously on The Great British Bake Off: Marie experienced a spectacular fall, tumbling from Star Baker to second person to go home, while Ian rocked biscuit week. Bread week! One of my favourites! The Bakewells head to the tent to make two free-form quick breads of any flavour. Paul explains that quick breads use no yeast, so you need to use bicarb and/or baking powder. Flora is doing rye, hazelnut, and fig breads, which sound like they could be nice, though that rye can be tricky to deal with. Mary notes that it often makes a fairly dense bread. Mat is making smoked salt and Mexican cheddar breads with jalapeno peppers. Sign me up, Mat! Nadiya is also doing a Mexican-inspired bread, with cumin and coriander and a tomato salsa. She jokes that Mat’s copying her. Dorret is making walnut and Stilton soda breads. Pretty standard, really. Mary loves soda bread, and so does Sue. Tamal is using goat’s cheese in his fig, cheese, and walnut breads which he says are really nice and rustic. They sound it. Delicious, too. Alvin is including prosciutto, Manchego and onion in his breads. Paul notes that Manchego’s a very strong flavour, which makes me think that Paul has pretty wimpy tastes in cheese, because no it’s not. At all. It’s about as strong as a mid-level cheddar, to me. But then, I’m a huge fan of really robustly flavoured cheeses. The VO tells us that getting the right loaf often depends on the ratio of bicarb to buttermilk. Not enough liquid and the loaf is too dense. Too much and it falls apart. Paul goes around quizzing everyone on their flour/liquid ratios. He seems to think that Paul (the contestant’s) bread is going to be too wet. Paul is undeterred and continues working on his cranberry and orange loaf. Ugne is topping her chocolate quick breads with salted caramel sauce. Sigh, salted caramel. Delicious stuff, but man am I getting sick of seeing it EVERYWHERE. We’re told that quick breads shouldn’t be kneaded, for fear they’ll be too tough. Ian is doing wild garlic pesto soda bread. YES. I actually have some wild garlic in the freezer, now I want to use some in a soda bread. In fact, I think I shall. Breads are formed and the breads are slashed, to help the heat get to the centre (and also to have a conduit for steam to go upward through, so it doesn’t explode out the sides of the loaf). Some slash deeply, others not. Sandy, who is doing a smoked bacon and onion bread, gets a pep talk about being super competitive from Mel. Breads go into the oven. Bakers wait. Breads come out of the oven. They all look quite yummy. Alvin’s prosciutto and Manchego breads look very tempting to Mary. Paul thinks the manchego is just too pungent. Wuss. Mary loves it though. Ian’s wild garlic soda bread looks nice and bright to Mary. She compliments the light texture and Paul agrees this is good. Dorret’s walnut breads have a very tight texture, which Paul thinks is because of the Stilton. He suggests she use less going forward. Nadiya’s Mexican bread has split along the side. Mary notes the heat and she and Paul think the taste is great. Mat’s Mexican bread has a lovely crust but Paul says it’s too bread-like and doesn’t crumble the way a soda bread should. He says it’s been overworked. Tamal’s fig, cheese and walnut breads is quite good. Sandy’s bacon and onion bread has good flavor and crumble. Flora’s fig and hazelnut rye breads work really nicely. Ugne’s chocolate and salted caramel breads smell of baking powder, according to Mary, but taste delicious. Paul’s cranberry and orange soda breads smell strongly of orange, which Mary likes. Paul (judge) declares them excellent and gives Paul a handshake. Alvin admits he’s feeling dangerously happy. For the technical challenge, the Bakewells have to make baguettes. Eh, not that hugely difficult. In the judges’ tent, Paul tells Mary you have to get a really good crust and an irregular internal structure. The dough is a fairly wet one, as is common with French breads. I actually prefer that—I find it produces a much lighter bread, which I prefer over a dense loaf. The dough is placed in plastic containers to prove, though apparently Flora misses that step and just puts it in a bowl, not really seeing how that’s different from putting it in the plastic bin. Then they have to let it rise. There’s some difference of opinion on whether to use a proving drawer, the oven on a proving setting (there’s a proving setting on those ovens? Where can I get one of those?) or at room temp. Proved dough comes out and is shaped, then placed on a linen cloth to support the loaves during their second prove. Bakewells sit around, waiting for loaves to prove. The loaves are placed on baking sheets and everyone wonders how to make the slashes. They put their loaves in the oven, and some of the bakers add water to create steam, which can help create a nice crispy crust. Breads come out of the oven and are presented. Paul and Mary come in and get started. Ian’s are good, crispy and good structure inside. Flora’s have been underproved but aren’t bad. Alvin’s look more like ciabattas but have the good, open structure. Dorret’s are a mess: underproved, different shapes, too many cuts across the top. Mat’s are a uniform size but had a split and lousy colour. Tamal’s are underbaked and too soft. Ugne’s have the same problem. Nadiya’s are super soft, have terrible cuts, and Mary feels sorry for whomever made them. Ouch. Sandy’s are too short and not crispy. Paul’s are the wrong shape (too fat) and barely baked. Last to first: Paul, Nadiya, Mat, Sandy, Dorret, Ugne, Alvin, Tamal, Flora, Ian. He hopes to reward himself with a bit of a drink in the pub. I think he should. Mat and Nadiya think they’re in trouble. It’s time to learn about how much Ukranians love their bread (so much that their flag is representative of a field of wheat under a blue sky). 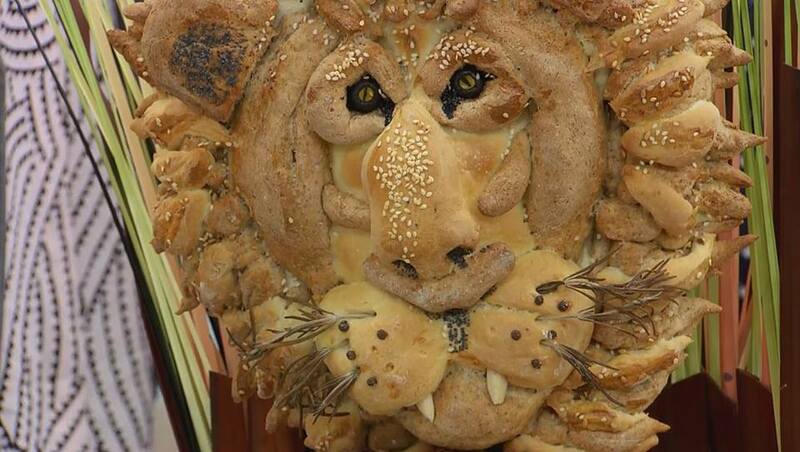 They make bread sculptures to act as the centerpiece at weddings. Mel goes to learn about how it’s made. A group of young women are gathered to make it, as is traditional. The woman in charge says that all the women working together are supposed to put good vibes into the bread. That’s a really nice idea. The bread is decorated with dough figurines of flowers, grapes, and birds. The bread is baked and decorated. Cool. It’s time for the showstopper. As the Bakewells head into the tent, the judges talk about who’s on top: Alvin, Flora, and Ian. In the bottom are Nadiya, Dorret, Mat, and Paul. For the showstopper they have to make 3-D bread sculptures, using three types of dough, one of which has to be filled. Jesus. Paul says this is one of the trickiest challenges they’ve ever had. I’ll say. They start making the rounds. Tamal is making a bread bicycle (didn’t someone do that a couple of years ago? I seem to remember that). The wheels will be a Chelsea bun, which sounds risky, since that’s a soft bun, but I’m sure he knows what he’s doing. Alvin is making a cornucopia with balsamic onion rolls and pain de Provence. Sounds elaborate and awesome. Paul is making a lion with a fig and walnut-filled body. He’s got a very involved sketch, so he’s clearly done a lot of planning. Mat is making the Brighton Pavilion with curry-inspired flavours. Clever! Paul asks how he plans to get everything to stick together. Gravity, says Mat. Paul just laughs. Nadiya is making a snake charmer basket. She’s worried about the snake just getting too big as it bakes. Sandy has some very sparkly shoes. She’s making a bread basket filled with plants. Doughs start to go into proving drawers and fillings are worked on. Flora is making three different herb breads for her herb couture bread skirt. Ian is making a flower out of bread, with one bread acting as the ‘dirt’ in a flowerpot. Paul starts sculpting his lion. Dorret is making a version of an artwork called ‘unmade bed’ with a raisin and fennel headboard, marzipan and cherry-stuffed mattress, and an enriched dough duvet. She’s not made this before. Sounds risky. Ugne is weaving a basket filled with an insane-sounding number of flavours. Coffee, cardamom, bacon, prunes, truffle oil! The judges seem doubtful, as am I, but part of that is because I really don’t like truffle oil. It also doesn’t seem to go with anything else. They start working on their filled breads, which, because of the filling, need more time to prove. Paul’s lion and some of the others’ bits and pieces start going into the oven. Ian has created a metal mould for part of his bake, while Sandy’s just draping dough over some crumpled tinfoil to make poppies. Some things start coming out of ovens and are looking really good. Some of them are troublesome coming off the moulds, but they get there. Alvin has made an incredible amount of bread for his bake. Ugne’s bunnies have lost their eyes. With 15 minutes to go, everyone is frantically building and decorating. Dorret’s starting to think hers looks too simple compared to most of the others. Time is called. Some of these look incredibly amazing. That lion is incredible. Tamal’s breadcycle is up first. It looks fabulous—it stands up, and it’s got braiding and weaving and all sorts of technique going on. The Chelsea bun is lovely. Sandy’s basket of bread flowers with walnut and blue cheese centre looks a bit clumsy to Mary and the flowers are bitter. The pesto grissini are good though. Alvin’s cornucopia requires help to carry, it’s so stuffed. The pain de Provence has great texture, and there’s some outstanding technique on the braided loaves. Paul says that each individual piece is perfect. Ugne’s Easter basket is troublesome: that truffle oil just doesn’t work. The bakes are all good though. Ian’s flowerpot looks truly magnificent to Mary, and Paul likes that it’s actually one sculpture, as they asked. The flavours are good. Flora’s herb skirt and corset is lovely and Mary loves the delicacy of it. Her pesto breads are amazing. Nadiya’s snake charmer’s basket is gorgeous and Paul loves the remarkable bright red colour of the snake. It tastes delicious too. The basket was a teensy bit soft though. Paul’s lion is fantastic. Paul says it’s one of the best things he’s seen in bread, ever. I’ll say. He wouldn’t have even tried to do it. It also tastes fantastic. I think he and Nadiya both just saved themselves with this one challenge. Mat’s Brighton Pavilion is adorable! The large loaves are underproved and underbaked, but the flavor is good. Dorret’s unmade ‘bread’ doesn’t get high marks on presentation. Paul doesn’t think it looks like five hours’ work. The flavours are nice, though. The centre of the mattress buns is raw. The judges’ confer. Paul’s still raving about the lion. As I expected, Paul and Nadiya saved themselves with their showstoppers. Alvin has gotten very high marks—Paul liked his signature the best (what? I thought he didn’t like that Manchego), and he came in high on the technical. Back in the tent, it’s time for the verdict. First, they’re doing a special commendation to Paul for making a sculpture that made judge Paul rave. He gets a round of applause. Star Baker is then awarded to Ian, who’s really cleaning up so far, isn’t he? Sadly, though, it’s time for Dorret to go home. She seems pretty ok with it. Mary interviews that not testing your showstopper at home is not smart. Paul tells us he’s had a word with Mat and told him to step it up. Next Next post: The Great British Bake Off: Don’t They Always Make Desserts?